Striker Alexandre Lacazette admits Arsenal need a "miracle" if they are to win the Premier League this season. The Gunners have taken just one point from their last two league games and make the short journey to West Ham on Wednesday night sitting 17 points adrift of leaders Manchester City. Arsene Wenger's side also have the likes of Manchester United, Chelsea and Liverpool ahead of them in the table as they look set to miss out on a title they have not lifted since 2004. Lacazette, a reported Â£46.5million summer signing from Lyon, may be rested for the trip to the London Stadium as fellow France international Olivier Giroud is in line for his first league start of the campaign. After moving from Ligue 1, Lacazette has eight goals for Arsenal despite having completed 90 minutes on just two occasions. He has also conceded that title success in his first season in England now looks to be a pipe-dream but insists a return to the Champions League was always Arsenal's main aim this year. "It would be really complicated to win it at this point," he said when asked about a potential tilt at the title. "We would really need a miracle. City would need to lose a lot of their games and we know their record. But the goal in coming here was always to qualify for the Champions League and if we could get the title, fantastic." Lacazette is the latest in a long line of French footballers to ply their trade under compatriot Arsene Wenger at Arsenal. The 26-year-old had the best conversion rate of any player to score more than 20 goals last season across Europe's top five leagues. He revealed the lure of playing under Wenger was a major part of him joining Arsenal but said he does not want to follow in the footsteps of the club's record goalscorer Thierry Henry and instead is aiming to walk his own path. "It was really the meeting with the coach that made me want to come here, it was something I had thought about since I was little," he said. "I had spoken about it a lot for many years with (Arsenal midfielder) Francis Coquelin but it was really all about that meeting with the coach. "I benefit from his experience on a daily basis, especially his past and how he has worked with various strikers. "We are always chatting about small things I can do to make little improvements. It will be a really nice record for him too." 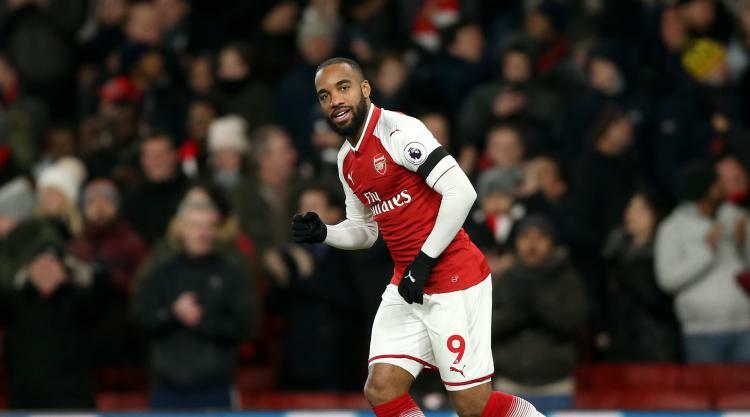 Asked if Henry's success at the club acted as inspiration, Lacazette added: "I guess, in terms of inspiration I do admire him but I wouldn't want to copy him. "Everyone has their own career, their own fate and everyone writes their own story."